At the time I was a big, huge horror movie buff (Mostly through watching the likes of any Stephen King movie adaptation from Carrie and Salem's lot to IT and Stand by me) Also I was a massive Michael Jackson fan too. I remember seeing the movie 'Bram Stoker's Dracula for the very first time when it came out on video in 1992/93 and just how taken in by this whole atmospheric, Gothic and horrific, yet tragically beautiful love story. I have no idea how many times I even watched this movie on a continuous loop, far too many to count lol. I was obsessed. I then bought the book and read this many, many times aswell. I think it must've been my fifth or sixth reading of Stoker's original novel when I suddenly became both infected and compelled with this crazy notion to write a sequel to Bram stokers Dracula... and so I did. I hand wrote around four, A5 notebooks, full of this awful, misspelled and grammatical mishmash nonsense story. It took me about two or three weeks to write and then I had my own mother re write it into much neater and tidier notebooks with her own gorgeous hand writing. She was a really good mum and still is to this day lol Always taking an interest in my writing. Plus, this was the early nineteen nineties, the mad old days of Vanilla Ice and teenage mutant Ninja turtles and well before the social networks of the internet, lap tops and electronic book readers. My second work of art lol or an attempt at some more serious writing was when I wrote a kind of musical screenplay for Michael Jackson soon after my Dracula Opus. I used songs such as Billie Jean, The way you make me feel, Dirty Diana and Smooth Criminal ect, along with a blending of my own writing to tell a kind of love story set in a nineteen thirties gangster era. I remember having so much fun writing this at the time, that even now it brings back so many great memories just to think back at my enthusiasm. Ha, it even makes me want to listen to some MJ music again, even though I never listen to him anymore these days. (I pretty much played him to death all throughout the nineties to my parents annoyance) Also I have no idea where this masterpiece of writing and early phenomena of mine is. Possibly in some old dusty cobwebbed box, inside a bigger box, wrapped up in old clothes, pictures, books and memorabilia in the far corner of my Mother's attic. And lastly, my inspiration for writing today, comes from living in such a beautiful, Gothic, awe inspiring, dramatic and historical city such as Edinburgh. This place has given so much great inspiration to write and write and write the more time I spend dwelling here with her. I mean I challenge anyone with 'so called' writers block to take a walk up and around the magical Carlton hill (In any kind of weather too, which will usually be a windy rain storm even in the heart of summer) in Edinburgh's city center sometime, and just kick back, relax and enjoy the majestically views of our glorious castle, Princes street gardens, the bridges, the breathtaking and spectacular volcanic Munroe 'Arthur's seat', The river fourth, the Greek influenced national monument on the very top of the hill (Which is where Edinburgh gets its nickname 'Athens of the North' from.) And of course the view of the fabulously Gothic monument of Sir Walter Scot, our greatest and most famous ever writer to date. Born in London to Scottish and Irish parents, I spent most of my childhood and teenage years growing up on the move in the likes of Cyprus, Germany, Wales and Australia as an army brat. 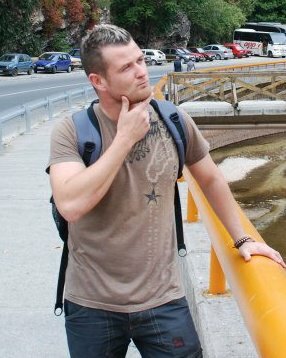 With a keen interest in both reading and writing I was diagnosed with the travel and writing bugs very early on in life. Now, writing, reading and traveling are pretty much my main passions in life, but I also love outdoor sports too from Rugby and Hiking to Tennis and Boxing. I'm writing another few books at this very moment, one is about a young man working in a dead end job and life who discovers that he has a terminal illness so decides to withdraw all of his savings from the bank and being doing all the things that he's always wanted to do, but was restricted by the rules and regulations that society feeds into us from birth. The other book is about my recent four month awesome back packing adventure through Eastern Europe last year, from Estonia to Sarajevo. I'm also looking forward to more traveling and writing adventures in the near future. I also try and treat each day like it were my last and in the words of a famous basketball player, you miss one hundred percent of the shots you don't take in life. So far I have self published 3 books on both paperback and kindle. 'Sarah Smiles' The novel is a coming of age love story and young adult adventure. 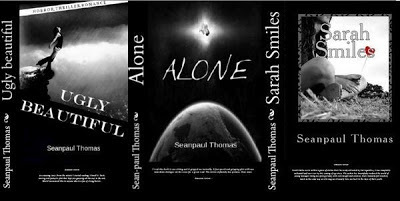 'Alone' The novel is a stand alone Science fiction, psychological mystery. 'Ugly Beautiful' This novel is a mix of Genres between Romance, Mystery, Horror and Psychological thriller.